The flight from Ushuaia was uneventful and we landed in Buenos Aires about 15 minutes early. The approach from the east to the domestic Aeroparque airport is very nice if you have a window seat on the left, with great views of the city. Clapping in the plane still appears to be a thing here and strangely it started right at the moment of touchdown when many things could still happen, including a go around. According to the pilot’s announcement it was 29 degrees at 19:30, a far cry from Fuegian summer, to put it mildly. The bike and box appear to have survived just fine. The drive into the city was “interesting”. Wide avenues, busy traffic on a Sunday evening and large monuments and buildings are quite the change. The city proper has 3 million inhabitants and the urban area well over 10 million. The last metropolis I visited was Mendoza in October, so this took some getting used to. I got to the hostel at 21:00 and I was glad to find out they have a bar that also serves pizza, so I didn’t have to go out for dinner. Of course this was a perfectly normal or even early time to do so, but I was tired enough that I took the easy way out. Another welcome change is the return of the litre bottles of beer as well as reasonable prices for everything. A big bottle here is cheaper than a pint in Patagonia. I celebrated the completion of my tour with steak – what else – and then had some beers in the local Irish pub, since that’s where tourists everywhere are supposed to go for a drink or two. Or more. New Year’s Eve was a massive anticlimax. Río Grande isn’t a very touristy city, so there aren’t many places to go out to begin with. When William and I went out to find a restaurant that evening, everything turned out to be closed. Back to our rooms we went to have some bread for dinner. I was asleep by midnight and I didn’t hear any fireworks to wake me up. Consequently I had no problem getting started on New Year’s Day. 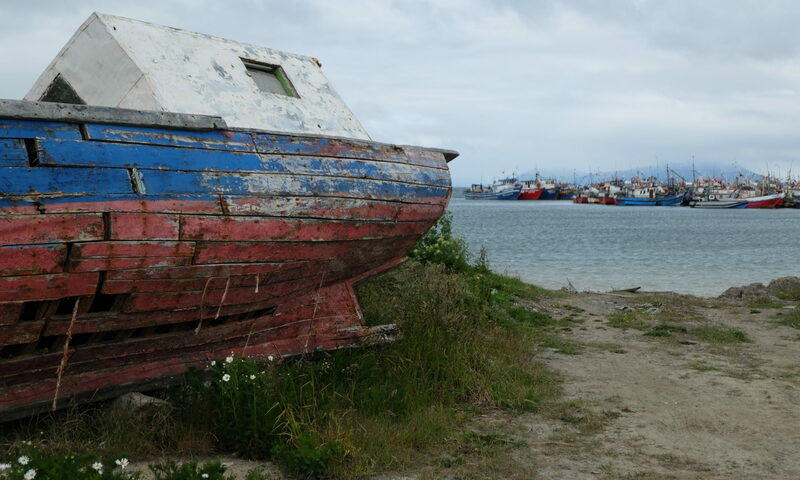 William had already left earlier, as he is in a hurry to get to Ushuaia. 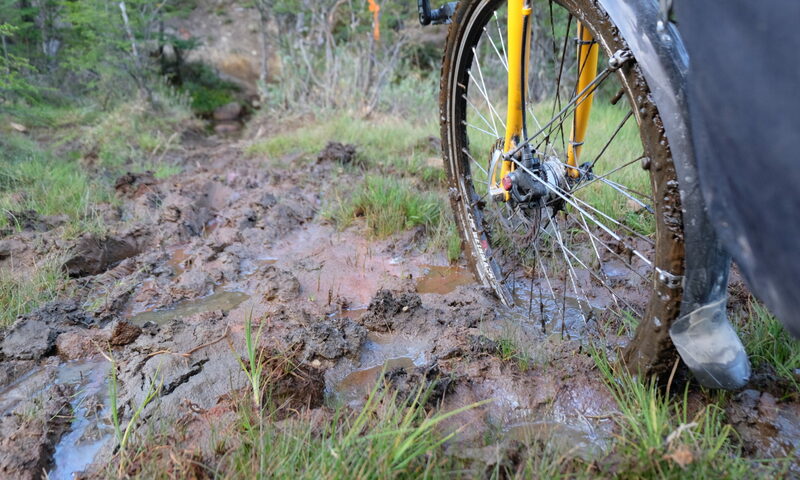 I have plenty of time and want to take the path less pedalled again. When I got outside and finished loading my bike I first put on sunglasses, as it was such a nice day. There was hardly any wind and Windguru says it will stay that way for several days. If that comes true I’ll have an easy ride into Ushuaia indeed. 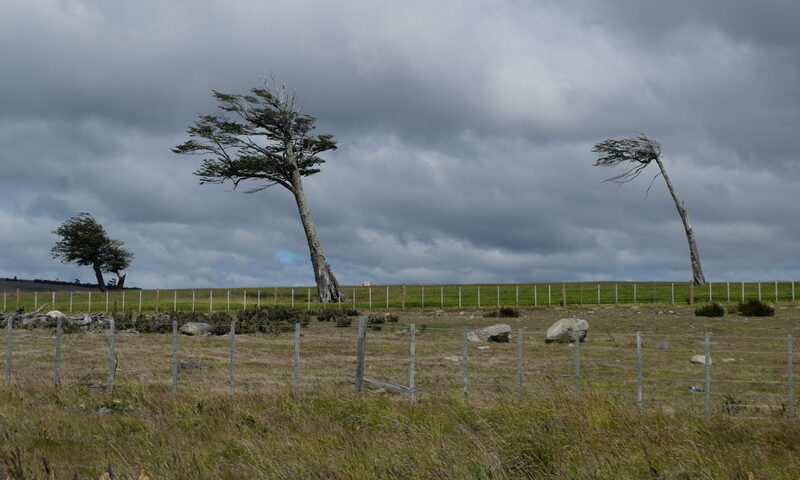 It appears to me that southern Tierra del Fuego has much less wind in general, judging by the trees I saw. The ferry leaves at 9:00 and I planned to leave the hostel well before 8:00 to make sure I would certainly be on time. By about 7:00 I had all my bags packed and went downstairs. The manager was preparing breakfast and said it would be available at 7:30. He also said that 8:00 would give me plenty of time to catch the ferry. Thus I sat down in the common room with one of the hostel’s books to wait for breakfast. And boy am I glad I waited! This was probably the best breakfast I had in South America, with yogurt, cake, fresh fruit, bread and even an omelet. I was the first at the breakfast table and also the first to leave just before 8:00. The ride to the ferry terminal is about 6 kilometres, so no problem there. It is still a good idea to arrive early, since there was quite a long line of people waiting to buy a ticket. Cyclists only need a passenger ticket, the bike is taken on for free. The boat is quite a lot larger than the other ferries I’ve been on, with room for several large trucks as well as a number of cars and hundreds of people. It’s also the first roll on-roll off ferry. Up to now I had only seen smaller boats onto which cars had to enter in reverse. It was a beautiful morning for a boat ride with sunshine and once we got moving there was effectively no wind on the boat, as its velocity matched that of the ship. But of course this wouldn’t be Patagonia if it stayed that way. We arrived two hours later in Porvenir with a rather different wind and rain. 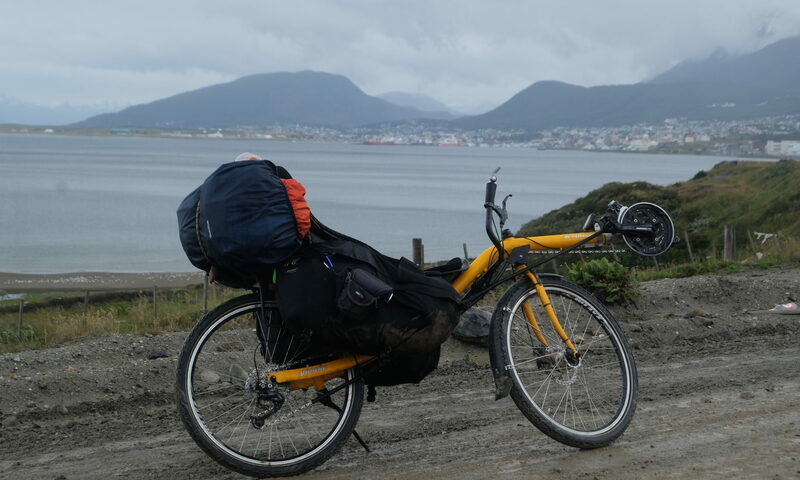 During the ride I felt extremely happy and a bit strange to finally be going to Tierra del Fuego, pretty much the end of the Earth and my goal for such a long time. On Christmas day I got started a bit later than usual, but so did my host. At breakfast I got a large piece of cake in addition to the usual bread. As I walked out the sun was shining and I got quite warm, so I was thinking about removing a layer of clothing, but decided against it for now. When I got onto the road the sun disappeared and I was soon adding layers instead. William spent Tuesday evening and most of Wednesday in bed being ill. Thursday, the first day of summer, was our planned departure date and that morning he said he felt fit enough to ride. We left just before 10:00 the same way we had entered Calafate, heading east. We were somewhat disappointed about the absence of a strong wind this morning, which should normally help us along for the first part. There was still a little bit of a northwesterly wind, which is good. William was having trouble riding and after 16 kilometers decided to stop for today. He would try to hitch a ride, though he didn’t know yet where to. Thus I continued alone. The first 45 km are more or less flat and I was easily averaging 20+ km/h. Then started the largest climb still left and also one of the higher ones on the whole trip. It was however a very pleasant gradient and the wind was also getting a bit stronger now, pushing me uphill. On the hill I saw two bikes parked by the side of the road and two people eating down below. Since I was doing so well on the climb I decided not to stop to talk to them. Thursday we had bad weather all day, so we spent most of it in the Casa del Ciclista. I had some things that needed repairs or replacement, so I looked around town for these. I succeeded with my bags, but did not find anyone to repair my phone. 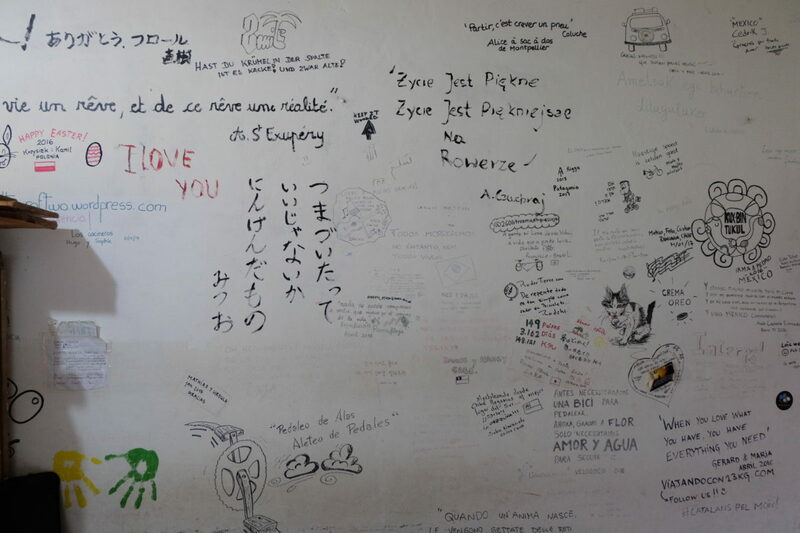 Writing on the wall at the Casa del Ciclista. El Chaltén is one of the hiking and trekking capitals of South America, together with Torres del Paine, so some hiking is in order. 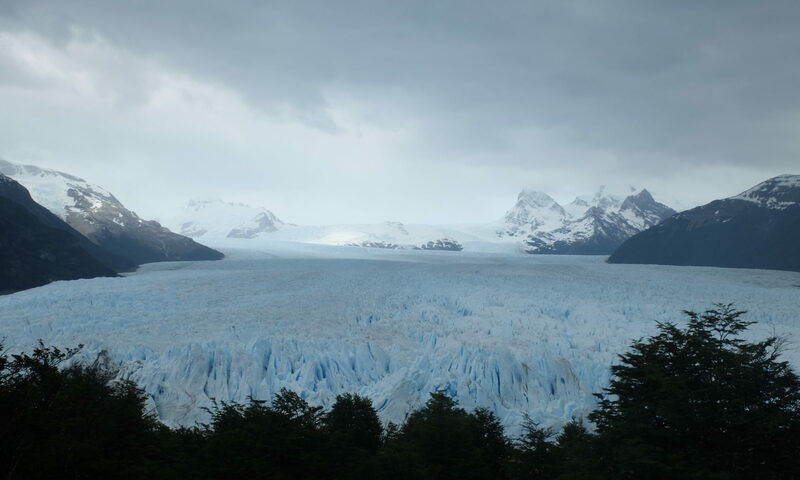 While it would be great to walk the Cerro Huemul circuit that gives one a view of the Southern Patagonian Ice Field, this was not really an option for various reasons: It takes too much time and you need four days of good enough weather. Some people were already waiting for a week for weather to improve, so that won’t work for me. I also think that my current setup is not that great for such an extended trek. Thus, William and I decided to go to the more accessible Laguna de los Tres and Laguna Torre on Friday and Saturday. 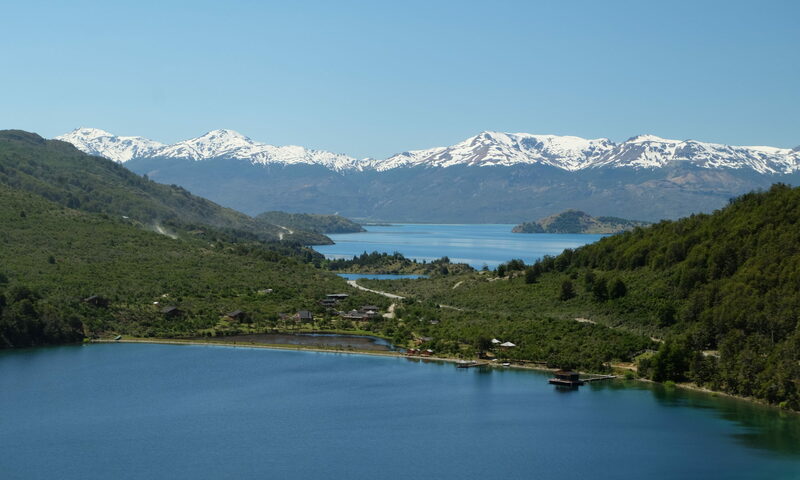 The Carretera Austral is sometimes called the road at the end of the road, because it starts more or less at the end of the Pan-American Highway (depending how exactly you define that one) and continues south from there. But now we’ve reached its end too and there’s no more road to continue on. So what happens next? You take the boat at the end of the road at the end of the road of course! 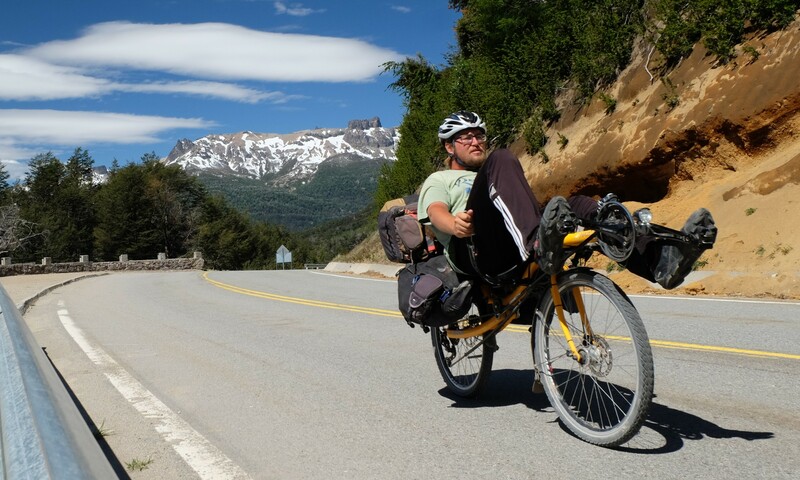 For cyclists and pedestrians it is possible to cross the border to El Chaltén in Argentina. Many borders are just an imaginary line on a map, but there is no imaginary component to this one, so it must be real then. Bad maths puns aside, it involves cycling, two boats and biking/pushing your bike through difficult terrain for 22 kilometers between the two lakes. 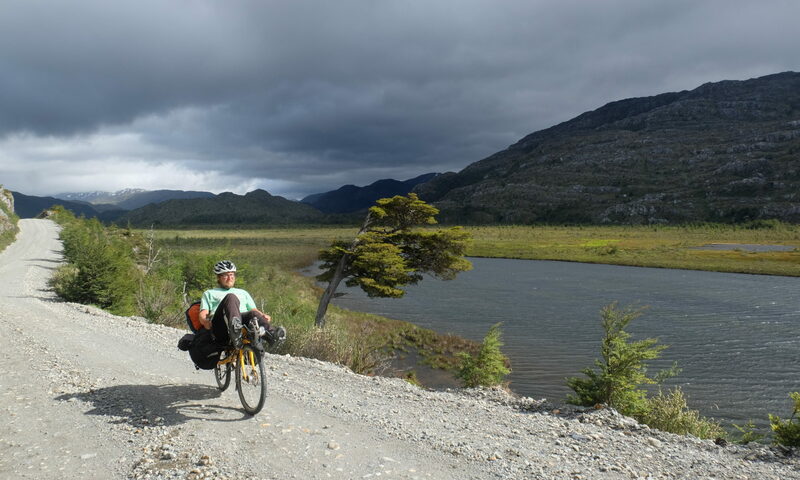 Like the Carretera Austral, crossing this border is is an essential part of almost every bike tour heading this far south. In Cochrane I started by going to a car mechanic I had already seen when I entered town. He couldn’t weld my rack and according to him there’s no aluminium welder here. He had another bike rack out of steel, but there’s no way that will fit my bike because of the rear suspension and generally non-standard setup. Then he suggested using strong hose clamps to hold the rack in place and sent me to a hardware store. I got a few clamps there, but I already didn’t like them much when I bought them. Indeed I found out they won’t work for me. As I was trying this at the hostel a motorbike rider arrived who also took a look. He suggested to just use strong zip ties or otherwise use small steel L-brackets. But that will have to wait for tomorrow. Looking at my bungee cord fix I think zip ties, applied correctly, are indeed likely to hold and it’s easy to carry spares in case they break. Update: I had contact with the bike’s manufacturer and they also suggest a fix using hose clamps in combination with a piece of wood, so I’ll try that soon. The meetings continued in Coyhaique. When I was walking back from picking up my laundry I saw Tim and Timo entering town, who will stay here tomorrow. The fuel bottle for my camp stove was almost empty, so I’d been looking for white gas for a while, but unable to find it. Thus I went to a fuel station before leaving the city and had it filled with regular petrol. The lady operating the pump filled the bottle all the way to the brim, so now I have too much fuel to cook safely. 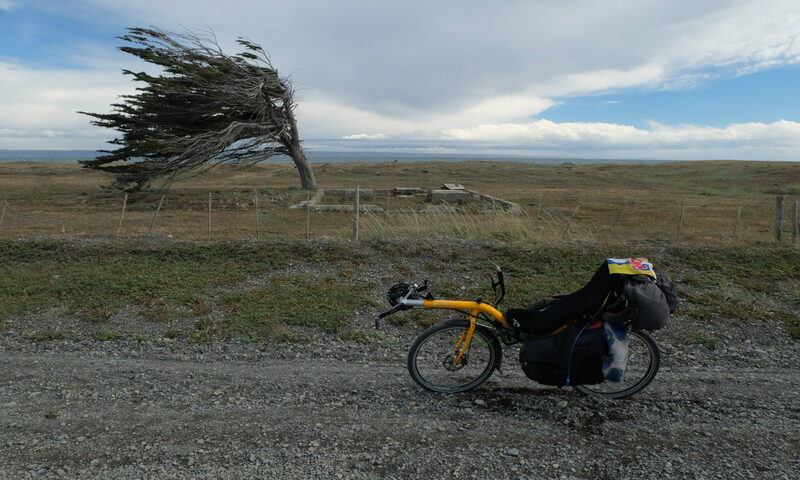 I’m Stef and on this blog I write about my bike tour in South America and other things.